"Mihai Viteazu" redirects here. For other uses, see Mihai Viteazu (disambiguation). Michael the Brave (Romanian: Mihai Viteazu(l) pronounced [miˈhaj viˈte̯azu(l)] or Mihai Bravu pronounced [miˈhaj ˈbravu], Hungarian: Vitéz Mihály; 1558 – 9 August 1601) was the Prince of Wallachia (as Michael II, 1593–1601), Prince of Moldavia (1600) and de facto ruler of Transylvania (1599–1600). He is considered one of Romania's greatest national heroes. Michael was seen by 19th-century nationalists as the first author of Romanian unity. Michael was born under the family name of Pătraşcu. In 1601, during a stay in Prague, he was portrayed by the painter Aegidius Sadeler, who mentioned on the portrait the words aetatis XLIII ("in the 43rd year of life"), which indicates 1558 as the year of Michael's birth. Very little is known about his childhood and early years as an adult. He is argued[why?] by most historians to have been the illegitimate son of Wallachian Prince Pătraşcu cel Bun,[better source needed] (Pătrașcu the Good) of the Drăculeşti branch of the House of Basarab, while others believe he merely invented his descent in order to justify his rule. His mother was Theodora Kantakouzene, a member of the Kantakouzenoi, a noble family present in Wallachia and Moldavia, and allegedly descended from the Byzantine Emperor John VI Kantakouzenos. Michael's political rise was quite spectacular, as he became the Ban of Mehedinţi in 1588, stolnic at the court of Mihnea Turcitul by the end of 1588, and Ban of Craiova in 1593 – during the rule of Alexandru cel Rău. The latter had him swear before 12 boyars that he was not of princely descent. 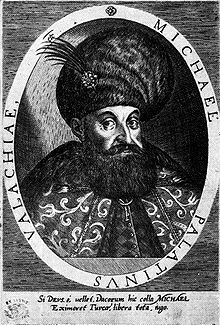 [non-primary source needed] Still, in May 1593 conflict did break out between Alexandru and Michael, who was forced to flee to Transylvania. He was accompanied by his half-brother Radu Florescu, Radu Buzescu and several other supporters. After spending two weeks at the court of Sigismund Báthory, he left for Constantinople, where with help from his cousin Andronikos Kantakouzenos (the eldest son of Michael "Şeytanoğlu" Kantakouzenos) and Patriarch Jeremiah II he negotiated Ottoman support for his accession to the Wallachian throne. He was supported by the English ambassador in the Ottoman capital, Edward Barton, and aided by a loan of 200,000 florins. Michael was invested Prince by Sultan Murad III in September 1593 and started his effective rule on 11 October. He was considered a traitor[by whom?] as he had been forced to purchase the title of Domnitor (ruler). When Michael entered Transylvania, he did not immediately free or grant rights to the Romanian inhabitants, who were primarily peasants but, nevertheless, constituted a significant proportion[notes 1] of the population. Michael demonstrated his support by upholding the Union of the Three Nations, which recognized only the traditional rights and privileges of the Hungarians, Székelys and Saxons, but he didn't recognize the rights of the Romanians. There is no evidence that Michael wanted Transylvania's Romanians to play a political role. Indeed, while he brought some of his Wallachian aides to Transylvania, he also invited some Székelys and other Transylvanian Hungarians to assist in the administration of Wallachia, where he wished to transplant Transylvania's far more advanced feudal system. Petre P. Panaitescu states that in Mihai's time, the concept of the Romanian nation and the desire for unification did not yet exist. [verification needed] A. D. Xenopol firmly states the absence of any national element in Michael's politics, holding that Michael's lack of desire to join the principalities' administrations proved his actions were not motivated by any such concept. ^ "Târgul de Floci, locul unde s-a născut Mihai Viteazul". Adevărul (in Romanian). 22 July 2011. ^ Kemp, Arthur (May 2008). Jihad: Islam's 1,300 Year War Against Western Civilisation. ISBN 978-1-4092-0502-9. ^ "Michael PRINCE OF WALACHIA". Britannica. Encyclopaedia Britannica. Retrieved March 25, 2019. ^ Giurescu, p. 180.; Iorga. ^ According to the 18th-century chronicle of Radu Popescu. "Rumania" . Encyclopædia Britannica. 23 (11th ed.). 1911. p. 832. ^ C. Rezachevici – "Legenda şi substratul ei istoric"
^ a b c Giurescu, p. 186. ^ a b c Giurescu, p. 193. ^ a b Giurescu, p. 194. ^ Helen Matau Powell. Matau Family History & Related Lineages: With a Brief History of Romania. University of Wisconsin – Madison, Gateway Press, 2002. ^ "History of Transylvania by Akadémiai Kiadó". Mek.oszk.hu. Retrieved 18 September 2013. ^ George W. White (2000). Nationalism and Territory: Constructing Group Identity in Southeastern Europe. Rowman & Littlefield. ISBN 9780847698097. ^ a b c Giurescu, p. 198. ^ a b Giurescu, p. 199. ^ a b Giurescu, p. 200. ^ Boia, Lucian (2001-01-01). History and myth in Romanian consciousness. ISBN 9789639116979. Bolovan, Ioan; Kurt W. Treptow (1997). A History of Romania (3rd ed.). Iași: Center for Romanian Studies. ISBN 978-973-98091-0-8. OCLC 39225262. Giurescu, Constantin C. (2007) . Istoria Românilor (in Romanian). Bucharest: Editura All. Homutescu, Adrian. "Elements of Romanian Heraldry". Archived from the original on 23 March 2008. Retrieved 3 March 2008. Ionaşcu, Ion (1962). "Mihai Viteazul şi autorii tratatului de la Alba Iulia (1595)". Anuarul Institutului de Istorie şi Arheologie, Cluj-Napoca (in Romanian). 5: 111–44. ISSN 0253-1550. OCLC 20377434. Iorga, Nicolae (1904). Ștefan-cel-mare și Mihai-Viteazul: ca întemeietorii bisericii Românilor din Ardeal (PDF) (in Romanian). Bucharest: Minerva. OCLC 18153903. Retrieved 3 March 2008. Iorga, Nicolae (1968). Istoria lui Mihai Viteazul (in Romanian). Bucharest: Editura Militară. OCLC 1243864. Jarausch, Konrad Hugo (2007). Conflicted Memories: Europeanizing Contemporary Histories. New York:: Berghahn Books. OCLC 493876549. Manea, Cristina Anton (2003). "Structura şi restructurarea marii boierimi din Ţara Românească de la începutul secolului al XVI-LEA până la mijlocul secolului al XVII-LEA" (in Romanian). Archived from the original (PhD. Thesis) on 8 February 2008. Retrieved 3 March 2008. Panaitescu, Petre P. (1936). Mihai Viteazul (in Romanian). Bucharest: Fundaţia Regală. OCLC 29925825. Rezachevici, Constantin (November 1999). "Mihail Viteazul: Cele patru itinerarii transilvane". Magazin Istoric (in Romanian). ISSN 0541-881X. OCLC 2263749. Archived from the original on 10 October 2007. Retrieved 3 March 2008. Rezachevici, Constantin (May 2000). "Mihail Viteazul: Itinerariul moldovean". Magazin Istoric (in Romanian). ISSN 0541-881X. OCLC 2263749. Archived from the original on 26 September 2007. Retrieved 3 March 2008. Rezachevici, Constantin (October 2000). "Legenda şi substratul ei istoric. Mihail Viteazul Restituror Daciae?". Magazin Istoric (in Romanian). ISSN 0541-881X. OCLC 2263749. Archived from the original on 22 December 2007. Retrieved 3 March 2008.